Table tents are one of the most flexible marketing tools around. Not only can they function as advertising materials, they are also great table decors. Our table tent printing is available in horizontal or vertical format. We print your designs using durable glossy or matte card stocks. It features die-cut interlocking slits for easy setup. Two standard sizes and layouts are available : 5 x 7" (horizontal), and 4.25 x 6" (vertical). Choose among 3 different kinds of card stock finishes - high gloss, gloss and matte. Order quantities ranging from 50 to 200 are printed digitally, while larger orders will be run through offset printers. Consult our customer service representatives for more details. Standard turnaround time is 6 business days. For any concerns or inquiries call us at 1.888.888.4211. 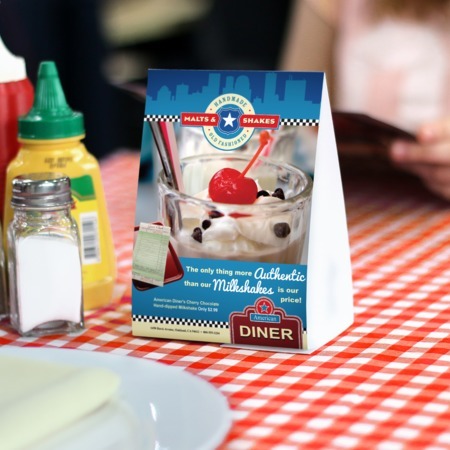 Table tents usually contain additional food selections not present in the menus of your restaurant or advertisements about products or services that.